Join ÅF Future Talent to perform your master thesis with us, get your own professional network and become an ÅF ambassador. 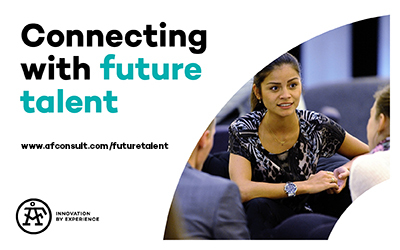 ÅF Future Talent is a training and networking programme taking place in Stockholm, Gothenburg and Lund. The programme runs over three semesters starting from the fourth year at university. During five days in spring you will get the chance to get to know ÅF and our business, build your professional network and get a mentor. The second semester you will be engaged in our employer branding activities as brand ambassador and during the last semester you will perform your thesis with ÅF. The program will start in beginning of 2016 and application period are open from 8th October until 20th November. our clients. By creating a diversity of employees, we are reaching our full potential.